Home » Life Hacks » Consumer Affairs » When greed backfires - an iPhone story. As you all know, the iPhone launched recently to a flurry of press and TV news coverage. 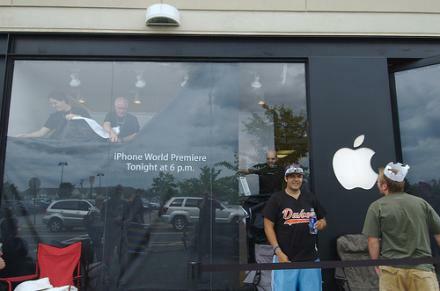 Eager geeks (sorry, but it seems applicable here) sat outside stores for hours and hours to buy the new phone, happy in the knowledge that they were about to get something that will help them feel a little bit cooler. Just a little. Far, far worse than these iPhone nuts, though, are the vultures. The folks with enough money to swoop down on a store and buy up a whole bunch of product, only to recycle them on eBay for double the price. Hey, that's good ol' healthy capitalism at work, right? Well, as you'll see in this video , money really doesn't buy you everything (hmm, that rings a bell ). Certainly not a stack of iPhones. It looks like this is one woman who has way more money than sense. And for all you geeks out there, you'll be pleased to know that there's a happy ending for your fellow iPhone nerds who really did just want a phone. Moral of the story...check the small print before you withdraw thousands from your over-stuffed bank account. Video link courtesy of Fox 4 news. thank goodness! those people are worse than ticket scalpers! I think the phone is cool and all that but the coolest thing is watching some over indulgent country club bimbo hose herself out of $800.00 of her husbands money I'll probably only say this just this once "way to go at&t"
I mean, it was pretty well-known that none of the stores were going to sell more than one iPhone to each customer. I'm not even following the iPhone madness, and that information had somehow filtered down to me. Looks like the Consumerist finally got wind of this - oddly enough, they didn't give you credit for linking the story. Hm. Maybe they found it on their own?